As mentioned on Instagram the other day, while I have thoroughly enjoyed the carefree, fly-by-the-seat-of-our-pants schedule that summer brings, school is starting soon (or, has already started for many of you!) and I'm definitely getting the itch to get my life back on a routine. I just know that back-to-school will hit me like a fast moving BUS if I'm not ready! Thus, I've decided to use August as my month to get back into a routine, get organized, and set up systems for a seamless Fall. Want to join me in getting back to PRODUCTIVE mode?? Sweet! The more, the merrier! All you need to do is enter your email address in the form at the bottom of this post, and starting Monday Aug 6 (so we have a few days to mentally prepare ourselves, ha!) I will email out a FREE month calendar, weekly challenges, and blog posts/videos galore to help us set up systems, routines, and structure (while still allowing for spontaneity and fun, don't you worry…) that will ease us back into reality this fall. So what do you say, who's with me?? Just enter your email below and let's get started! Send me all things Fun Cheap Or Free! Again, we will email you the month-long calendar starting Aug 6 (but keep in mind you can jump in ANY TIME after the 6th! ), and you can follow along all month long! 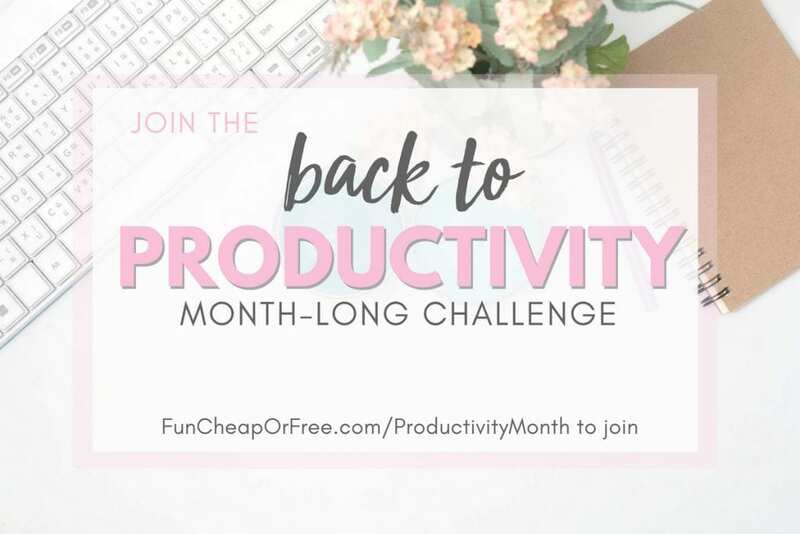 Post about it on social media using the hashtag #BackToProductivity for a chance to win prizes, and to share and see lots of productive inspiration throughout the month. I'm so excited to shake off these disorganized, unproductive cobwebs – how about you?? Yes! I’m soooooo ready. Needed this. Thanks Jordan! !